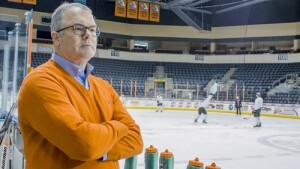 Lamar Hunt Jr. and the Missouri Mavericks: On Friday, February 6, 2015, Loretto Sports Ventures, LLC, a company owned by Lamar Hunt, Jr., announced that it had purchased the Missouri Mavericks of the East Coast Hockey League and that Lamar had been approved for ownership status by the ECHL Board Of Directors. The ECHL is considered the premier AA professional hockey league, and the Mavs play their home games at the Independence Events Center in Independence, Missouri. The Missouri Mavericks entered a new era for the 2014-15 season after a historic move to the ECHL. Last October, the Mavericks, along with six other teams of the former Central Hockey League (CHL), were formally accepted as expansion member teams into the ECHL. The Mavs have made the playoffs in each of their first five seasons, including winning the 2014 Bud Poile Governor’s Cup, capping a season of franchise record regular-season wins (44). The Mavs have been awarded numerous community and league awards over the years, including the Harry S. Truman Special Community Service Recognition Award by the City of Independence, and claiming Central Hockey League Franchise of the Year for the past four straight seasons. The Missouri Mavericks are proud to be Kansas City’s only professional hockey team and are dedicated to furthering the values and skill-level of hockey players and fans throughout the metro area. “We proudly welcome Lamar Hunt, Jr. to the ECHL,” said ECHL Commissioner Brian McKenna. “The Missouri Mavericks have been a welcome addition to our league and the new ownership group provides a strong local tie to what has been a great city for our sport.” Under the new ownership, the Mavericks will seek to raise the profile of the team regionally, seek affiliation with an NHL franchise and expand existing youth hockey programs in the Kansas City area.